So Deathwatch, the latest RPG set in the 40K universe. Basicly its the Dark Heresy rules system but focusing on space marines rather than acolytes of the inquisition. Personally I think this is an AWESOME idea. Generally I'd advocate against a space marine RPG, as they are a highly trained and very highly organised group of soldiers, I can't see there being much back and forth discussions on tactics on the usuall space marine battlefield, just orders going down the chain of command and reports comming back. However the choice of setting the RPG in the very a-typical deathwatch solves this problem, having marines from all differant chapters in a special elite group should make for some very interesting roleplaying. It also allows players to all play relatively specialised characters, with rules for apothacaries, techmarines and Librarians being present as well as more specialised basic marines (Devistators and Assault Marines) of course you can play a vanilla Tactical Marine. The book contains rules for playing several differant chapters of marines, which I can see being very fun. Roleplaying chapters with significant enmity between them (such as the Dark Angels and Space Wolves). There are only six chapters in the first book (Black Templars, Blood Angels, Dark Angels, Space Wolves, Storm Wardens (made up for this book), and the Ultramarines). I would imagine more will be comming in future expansions. There are rules for personalising each Marines armour (each machine spirit has its quirks), its also hinted that there will be rules for differing marks of armour (something I will have a geekgasam over if they actually do release). There's also rules for scout armour and terminator armour. 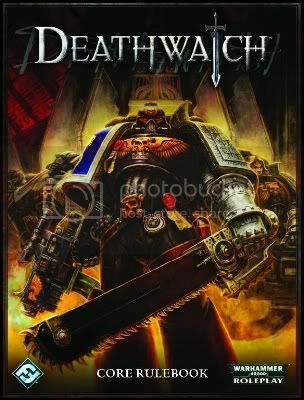 I have a number of the Dark Heresy books but have yet to play it, and to be honnest I'm actually more interested in playing Deathwatch than I have ever been in playing Dark Heresy. Why? because Dark Heresy always seemed a little ridiculas, you'd have to start campaigns with relatively weak opponenets as the starting characters just wouldn't stand up to any of the real threats to the imperium. Even a single chaos space marine would probably wipe the floor with a sensible group of starting characters. Deathwatch pretty much solves this problem, because you're playing a space team of space marines taking on something like tyranids or chaos demons isn't as dawnting, but it will still be a challange when the bigger beasties turn up. Where does this game fall down? Female players. I know some girls wont have a problem playing a space marine, but likewise some will want to play female characters which just isn't possible. However because this game is based arround the dark hersey rules I guess you could add characters from them with only a little work, I'd probably bump them up a good few levels so they actually stood a chance but it shouldn't be a problem. So after this rather long ramble is anyone interested? It seems a good game. I think a game Space Marine oriented is an awesome idea too. And what about the game system? I hope it's not like the last Warhammer Fantasy RPG! The stat system is pretty standard RPG, with most stats being out of 100 and die rolls on D10s and D100s. Stats are: weapon skill, ballistic skill, strength, toughness, Agility, intelligence, perception, willpower and fellowship. Strangely similar to first edition 40K, but with all stats going to 100 rather than to 10. Been a while since I've read the Dark Heresy rules properly but I remember them being fairly sensible.